Various biochemical and analytical techniques require the extraction of RNA from tissues. Isolating intact RNA is essential for many techniques used in gene expression analysis. In order to obtain optimal yields of RNA, the efficient disruption and homogenization of tissues and cultured cells are required. Diagenode's Bioruptor® Plus uses state-of-the-art ultrasound ACT (Adaptive Cavitation Technology) combined with unique devices such as beads or tubes acting as sonication « enhancers » or dedicated reagents (such as our RNA extraction reagent) to efficiently disrupt tissues and cultured cells in just one step to deliver high quality RNA extraction. Efficient extraction of pure RNA with high RIN. 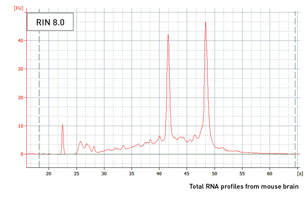 Total RNA profiles from mouse brain. Tissue was disrupted with Bioruptor® Plus as described in the protocol and analyzed on BioAnalyzer (Agilent). Note that small RNAs are present in all profiles indicating that the RNA is largely intact.